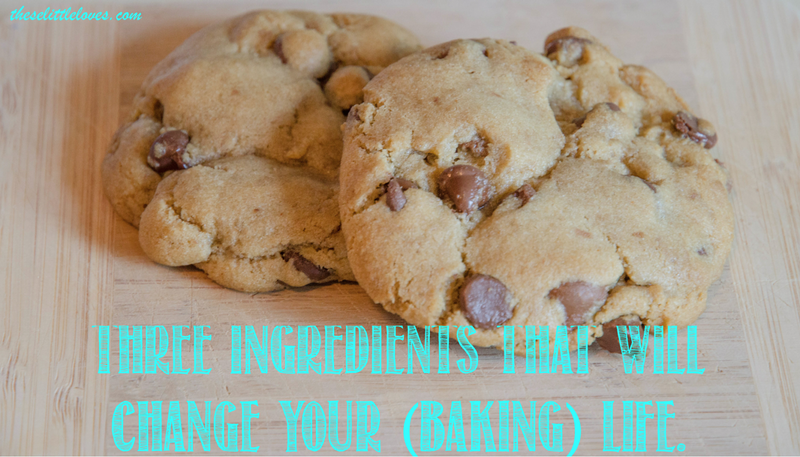 these little loves: Three ingredients that changed my (baking) life. I bake. I bake a lot. So it isn't often that something comes along and rocks my little baking world. I'd become a bit bored in the cookie realm until I came across three killer recipes. Two from Pinterest (surprise, surprise) and one from a sweet lady in TX. Maybe these ingredients are old news to you, but just in case I had to share. And bonus - I'm listing two of the recipes where I first experienced their awesome-ness (is that an actual word or just one my husband made up?). Browned Butter and Dark Brown Sugar - I'm sure they are great individually, but these are particularly awesome when they come together. Mmm...my mouth is watering thinking about all the nutty, caramely wonderfulness. My first introduction was via Nutella-Stuffed Brown Butter and Sea Salt Chocolate Chip Cookies by Ambitious Kitchen. Just the ridiculous title of these cookies convinced me to try this. Chocolate chip cookies are a classic favorite of mine and the thought of taking them to the next level had me giddy. Talk about an amazing cookie (and they are still great even when you leave out the nutella). Then I separately tried this recipe for Brown Butter Snickerdoodle Cookies which turns out is also by Ambitious Kitchen. Man that lady can bake! These were so good I just ate four of them, gave myself a stomach ache, and I still want more. And guess what - both of these recipes use brown butter and dark brown sugar. I'm a believer. And there you have it. A little nugget of baking happiness just in time for the holiday baking season. Try them - you won't be disappointed.